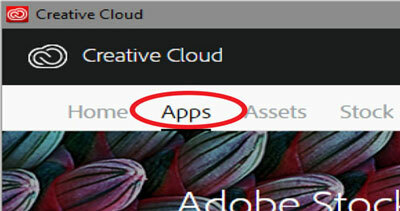 Adobe Creative Cloud consistently offers updates to applications like Photoshop, Illustrator, Premiere, etc. that can at times create compatibility issues between the Adobe applications downloaded on lab or classroom computers and the Adobe applications downloaded on personal devices. This incompatibility occurs because the lab or classroom computers do not have the same version of the Adobe applications as one may have downloaded on their personal devices and can result in the following message. Therefore, if you want to be able to edit the work you create in Adobe Creative Cloud apps both in the lab and on your own device, it is important to use the same version of the software. 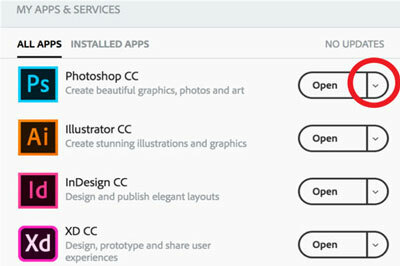 The information on this page will guide you through how to ensure the Adobe applications on your personal device and on lab and classroom computers are compatible. ** This new version is now available on the Apple Computers in 55 W. 13th street, 8th-floor Open Lab, except for the specialty Audio Stations. Use the process below to check which version of the Adobe application is downloaded on your own computer or in a lab or classroom. The steps below use Photoshop as an example, but all Adobe applications work the same way. 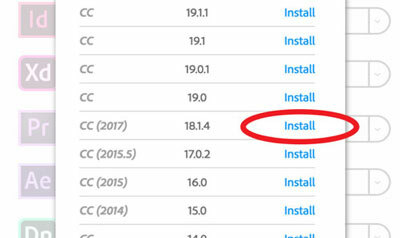 If you find that the version of the Adobe application you have on your personal device is different than what is downloaded on lab and classroom computers, you have the ability to download a compatible version on your computer by following these steps. *Keep in mind that downloading an older version on your computer does not mean files created on the newer version on the same computer will automatically be compatible on lab and classroom computers. For files to be compatible they must be made with the older version of the Adobe application. 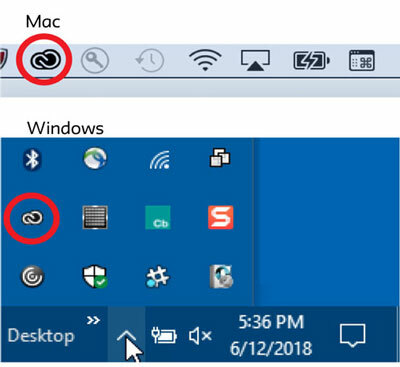 The Creative Cloud icon is located in the Apple menu bar (Mac OS) or taskbar (Windows) to open the Adobe Creative Cloud desktop app. 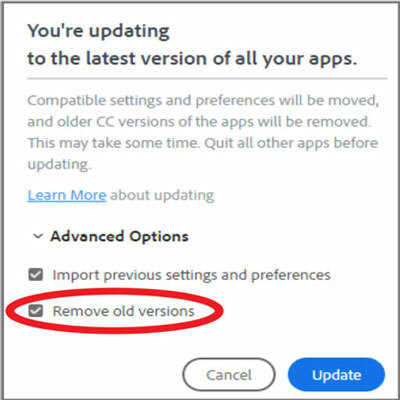 By default, when you install a new version of an application using the Creative Cloud app, previous versions of that application are uninstalled, leaving only the most recent version. To retain previous versions, deselect Remove Old Versions in the Advanced Options section of the updater interface.